Contact Resistance 50 m ohm typical,100 m ohm Max. A smart card, chip card, or integrated circuit card, is a pocket-sized card with embedded integrated circuits. Described by ISO7816 standard. Used in cellular phones, pay TVs, ATM cards, etc. There are two broad categories of ICCs. Memory cards contain only non-volatile memory storage components, and perhaps dedicated security logic. Microprocessor cards contain volatile memory and microprocessor components. A smart card, chip card, or integrated circuit card (ICC) is any pocket-sized card with embedded integrated circuits. Smart cards can provide identification, authentication, data storage, strong security authentication for single sign-on (SSO) and application processing. Physical, electrical and other characteristic of Smart cards are described by the ISO/IEC 7810 and ISO/IEC 7816 series of standards. 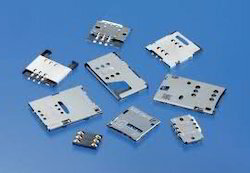 We are well known supplier of the SIM Card Holders. These are manufactured using the high grade raw material which is procured from reliable vendors. We offer these products with international standards. Our products are appreciated by our clients for durability and high class performance. We are engaged in offering Sim Card Holders to our clients. These are fabricated using quality material to give high durability to its end user and are available at market leading prices.